II. Cause: The most common cause of hallux valgus bunions is poorly fitted shoes that are tight, sharply-pointed, or extremely high-heeled. These shoe-related causes may explain why bunions occur much more frequently in women than in men. Research has shown that hallux valgus bunions also have hereditary links. Alternatively, hallux rigidus bunions are related to arthritis. 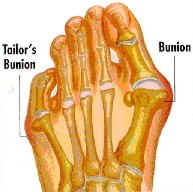 Arthritic changes in the joint of the big toe cause a spur to form on the joint, resulting in a bunion. III. Treatment and Prevention: The best way to prevent and alleviate bunion pain is to wear properly fitted shoes that conform to the shape of the foot. Shoes that are sufficiently wide, have wide toe boxes, and are low-heeled often provide considerable relief from bunion pain. In some cases, women must give up wearing high-heeled shoes altogether. If deformity from a bunion continues to progress, or pain persists despite changing to recommended shoe wear, you should seek treatment from an orthopeadic specialist. Surgical treatment of bunions is usually reserved for cases in which the pain is unresponsive to non-surgical treatments, or in severe hallux valgus cases, the deformity is so pronounced that it makes fitting shoes difficult. Hallux valgus surgery involves removal of the bone and re-alignment of the toe and underlying bone. Hallux rigidus surgery may involve cleaning out the joint, removing part of the bone, or in extreme cases, fusing the joint. In most cases, surgery can be done on an outpatient basis, with no hospital stay.